Finding great restaurants is one of my favourite things about travelling. A few weeks before I went to Seattle I asked my Twitter followers for some restaurant recommendations in Seattle. The awesome bearded dudes at Hired Guns Creative recommended Local 360 in Belltown, a few blocks from my hotel. Local 360, 1st and Bell. An Emerson quote on their sandwich board? I approve. 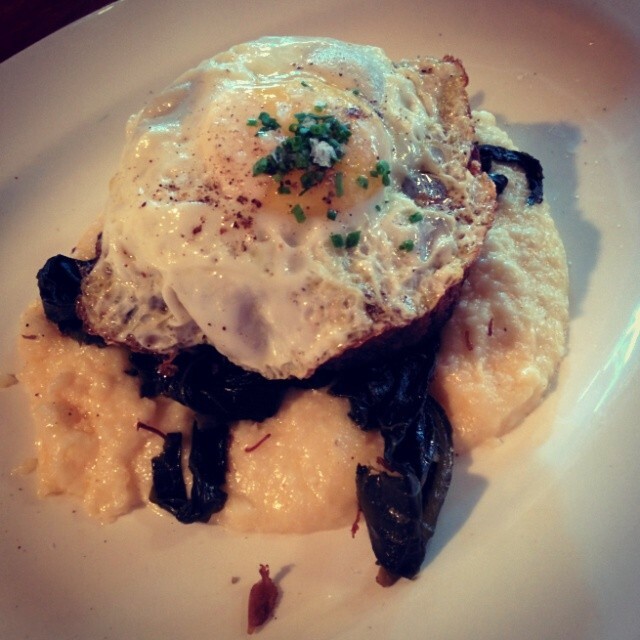 Local 360 uses locally sourced ingredients found within 360 miles of Seattle whenever possible. Their website has a sourcing page that outlines their philosophy. So, is the food any good? The “Fried Chicken” is actually a roulade made with chicken and bacon mousse. The chicken is tender and juicy, the seasoning of the batter is awesome, We don’t see a lot of collard greens or grits in Canada but they’re both great. The egg was a little over cooked but the yolk was still runny. All in all a tasty dish. 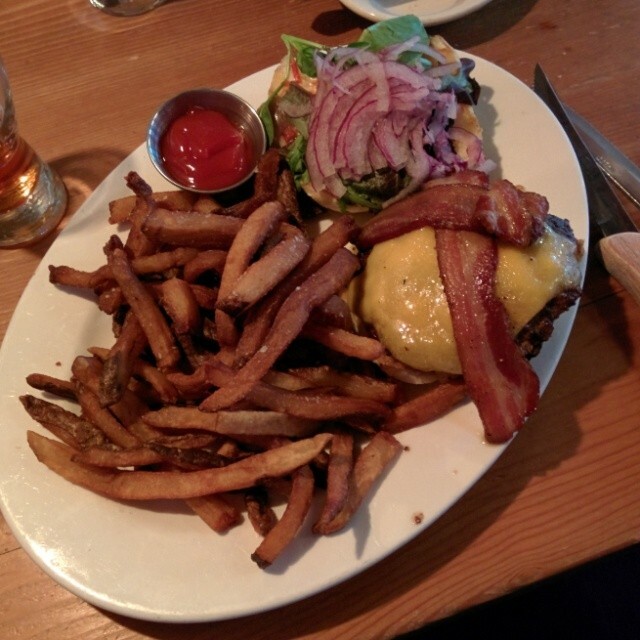 The Butcher’s Grind House Burger was the Hired Guns recommended dish and it didn’t disappoint. I ordered it medium with bacon and cheese (obviously). The patty was delicious, you could really taste and feel how fresh the beef was. It was seasoned perfectly and came on a fresh bun with the usual burger accoutrements, lettuce, tomato, onion, etc. I’d put this burger in my all time top 3. The fries are good too, hand cut and nicely salted. 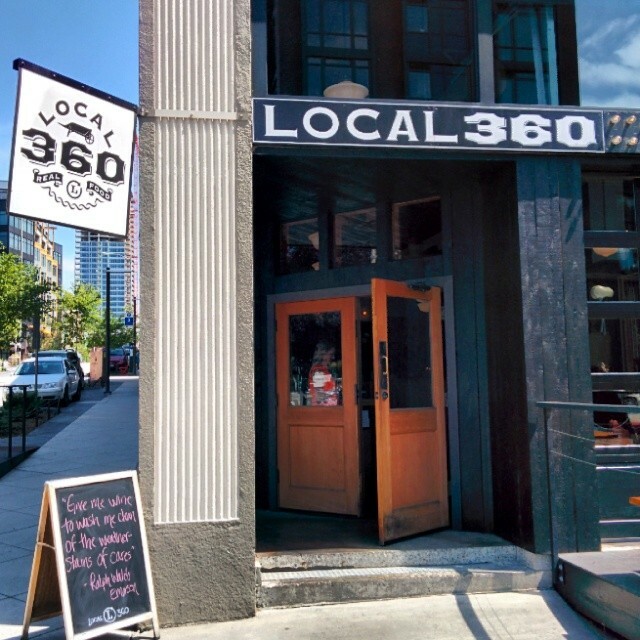 If you find yourself in Seattle and want a good meal you can feel good about eating check out Local 360. Ever wonder what would happen if someone took over a KFC/Taco Bell and started making the same kind of food but actually used good ingredients and cared about what they were serving? 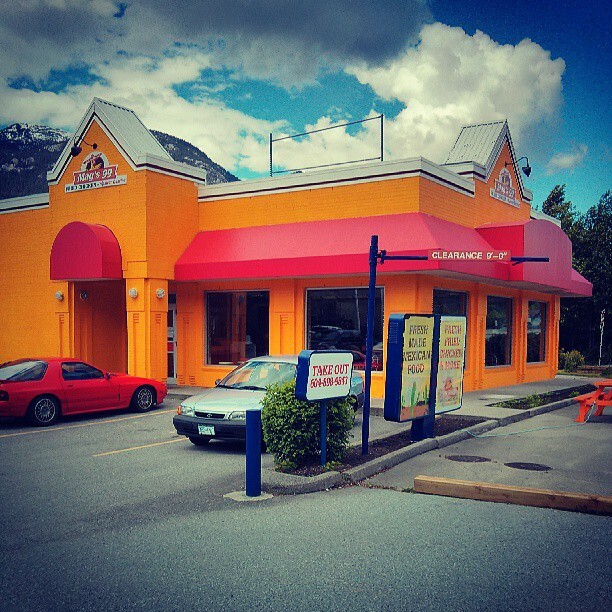 Just off Highway 99 as you roll into Squamish there’s a VERY bright yellow building that used to house the aforementioned fast food giants. 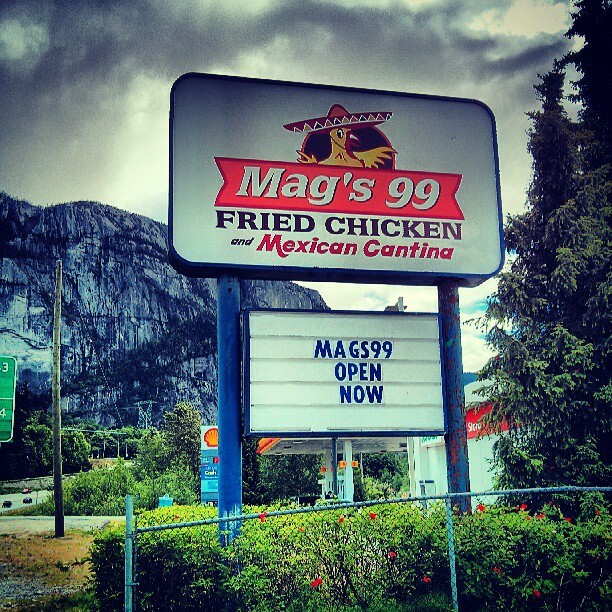 It closed about a year ago but has been resurrected as Mag’s 99, a fried chicken and Mexican joint using fresh, never frozen chicken and house made GOOD stuff with no preservatives whenever possible. I was in the mood for fried chicken, the Mexican dishes will have to wait for another visit, so I ordered the 3 piece “snack pack”. 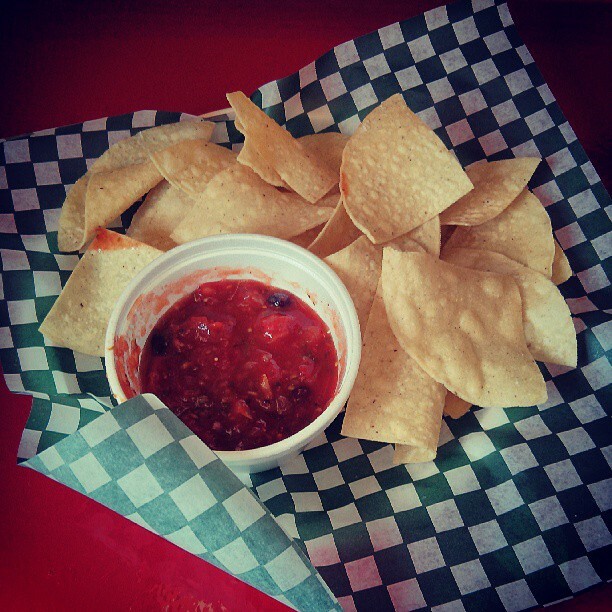 It takes up to 10 minutes to get your order but it’s piping hot and fresh when you get it and you get a plate of tortilla chips and chunky house made salsa while you wait. The chicken is everything that fried chicken should be, the flavours are very reminiscent of KFC or Churches but the quality of the chicken is far above any fast food joint. I had a thigh, a full wing and a breast in my combo with fries and a drink for under $10. The batter is delicious and you don’t get the greasy fried chicken hangover that usually accompanies fast food fried chicken. Verdict. 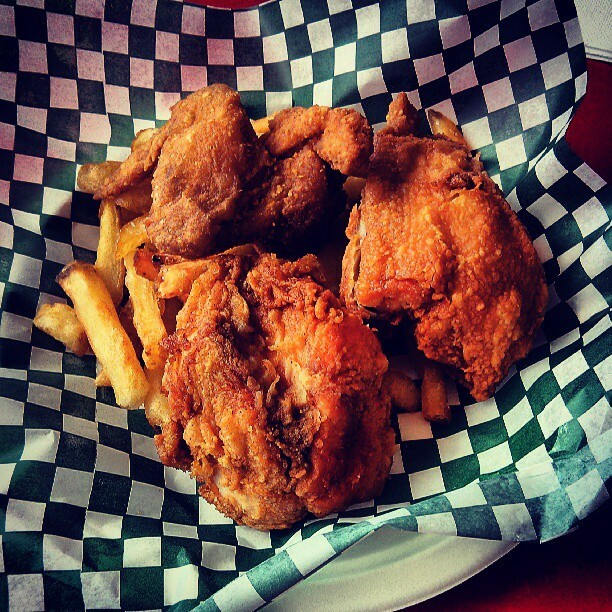 Mag’s 99 is good, classic fried chicken made by people who care. Go check it out if you’re in Squamish.